Welcome to Clark Manufacturing Company! Clark is a modern climate controlled machine shop, located in beautiful northern Michigan. Our clean and well-lit 55,000 sq. ft. facility is home to over thirty CNC turning centers and milling centers. We have four horizontal and six 5-axis milling centers. The lathe department has several lathes including twelve with live tooling for milling capabilities. 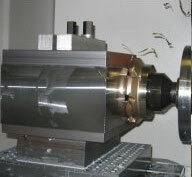 Clark Manufacturing keeps its equipment up-to-date with the latest technology in cutting tools. We employ a comprehensive preventative maintenance program that ensures quality and consistency throughout any size production run. We keep an extensive inventory of steels, stainless steels, and aluminum bar stock in house. We are within 24 hours of several major material distribution centers. Finished goods can arrive overnight to most locations in the Midwest. If you need quality parts and you need them quickly, please give Clark Manufacturing a call (1-231-946-5110). We live and work in the beautiful Traverse City area, but serve the Country!